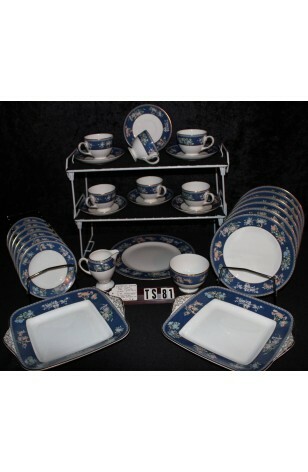 Wedgwood Fine Bone China Tea Set - "Blue Siam" Pattern - Made in England from 1985 through 1998 - Totaling (29) Pieces. This is a beautiful "Blue Siam" Pattern made by Wedgwood Bone China. The Pattern was only made for a few Years and is rarely on the market. Having an Oriental Flair, with Tan Branches Holding Pink and Blue Floral Sprays on a Blue Band. There is a Tan Greek Key Design on the Outer Rim. All Plates have 22kt Gold Verge and Rim. 22kt Gold Trim also on the Handles and Feet of various Pieces. Just an absolutely Beautiful Tea Set. This is a beautiful "Blue Siam" Pattern made by Wedgwood Bone China. The Pattern was only made for a few Years and is rarely on the market. Having an Oriental Flair, with Tan Branches Holding Pink and Blue Floral Sprays on a Blue Band. There is a Tan Greek Key Design on the Outer Rim. All Plates have 22kt Gold Verge and Rim. 22kt Gold Trim also on the Handles and Feet of various Pieces. Just an absolutely Beautiful Tea Set. All Pieces are in Good Resale Condition unless otherwise noted below or in pictures. 6 - Saucers - 5 3/4"
6 - Bead/Dessert/Tea Plates - 7"
6 - Luncheon Plates - 9"